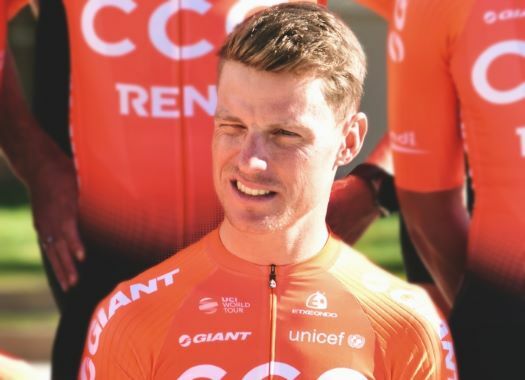 CyclingPub had the chance to talk to the Swiss rider at the usual training camp in Spain and check why he's one of the most likeable guys in the peloton. He talked about the renewal of the team, the past, the future and his 2019 season. With the change of BMC to CCC, does it feel somehow like you are changing teams? It feels a bit like a change because we have a lot of new faces, new bikes, a lot has changed, which is good. But there is still the core and some people stay the same and that's good. Which role are you going to play in this renewed team? My role is pretty identical to what I've done before, being a domestique rider helping mostly Greg and I will have pretty much the same schedule as he has. I'm going to be his helping hand in the races. Now that you don't have real GC guys, are the longer races going to change? Yes, I was always in the Tour de France for the big GC leaders. The first time we did it with Cadel Evans and he won. That was always the ideal scenario and we kept chasing that dream of Yellow. It didn't happen afterwards but I've always played the same role in the grand tours. So it means that I was always there, the domestique helper on the flat stages but now without a GC leader I'm gonna have more freedom, I'm gonna be more aggressive, more into breakaways, more going for opportunities. What kind of opportunities do you think you can chase now? That's going to be a new opportunity every day. Everything is possible now, we can go for stages, we can go for jerseys, Individual and Team Time Trials. It is more open, it's less controlled. Before when we got the jersey we would be controlling the race, now we can be more aggressive, be on the other side. I like it. It was a very successful year. I was happy with the year. We won a lot of team time trials, I was part of four of them. The highlight was the Tour de France, the team time trial was absolutely outstanding in my career. To go on the podium with all the team is very special. Normally there is only one guy on the podium, he wins but he needs all the other helpers to succeed. On a team time trial, everybody is there, everybody is on the podium, everybody is enjoying together and it is somehow special. A lot of the TT specialists have left the team like Stefan Küng and Rohan Dennis, do you think this will have an influence in the future TTTs? You have some big engines leaving, that is a fact. But we as a team are very well prepared, we have an extraordinarily strong performance group. And we saw last year that if you have an amazing strategy, you can beat teams with actually stronger time trialists. Like last year in the Tour de France, we beat Sky and if you see Sky's results in the individual time trial, they were in general minutes ahead of us. We can create a momentum in the team that makes us really invincible and this we didn't lose. Do you think the new guys can easily form part of that strong TTT group? 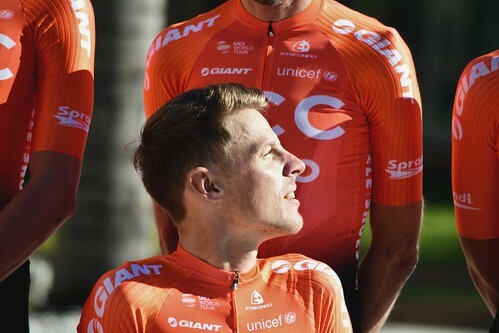 Definitely, we've got lots of really strong riders coming from CCC, they are tall, strong and have a good draft, which you actually need for a team time trial. I really believe in their capability of helping out and working together. Some of the new guys like Will Barta see you as one of the riders they can learn more from at the team, what do you think of this role as a mentor? It is interesting that the young guys say this because I see myself still as a young guy too (laughs). All of a sudden you switch positions and you have to be aware of your actual status in the team. Years ago I was a young pro, I was 19 when I went into the big teams and I have now spent 13 years in the business. For many years I was the young guy, the young kid looking up to other riders, for me my idol was Chechu Rubiera and I thought 'this is a great guy'. Now I look to myself, I analyse last year afterwards and I see my role in the team and I have the same kind of role. I tell them things tactic-wise, give them some advice on and off the bike and just be there if they have any questions. That's a role I really like. It is rewarding when you see the young talents evolving in your environment. It is something cool. What does it mean to you that the team has put its trust in you? The relationship with Och (Jim Ochowicz) is something special. From the very first day, and even when I was not in the team yet, I really liked him and maybe the sentiment was mutual. We have a lot of respect and he knows what he can get from me, I have been a really reliable helper over the years and he can trust that I am doing the job from January until October. It is a very well organised team, he built a super team around us and when I got all that trust from the team I see no reason for changing. Loyalty is very important for me and my family. Last year there were five Swiss riders in the team and now only you remain, do you experience any differences now? It is different. I am really going to miss some of the Swiss guys because for the first time in my career I'm the only Swiss guy. Before I was always with Andy (Rihs) and because of him there was a lot of Swiss influence. This time I'm alone and I'm really going to miss Stefan who is a really good friend of mine and we have a really good relationship on the bike and off the bike. And now that we're not going to be on the same team I'm really going to miss him the most. But I always also like a bit of internationality. If you have a team with a lot of different nationalities, it makes a good mix. This is interesting. If you have too many of one country, they start speaking their own language, they have their own little jokes so it's better for a team if you have a mix. Do you think with these new changes, the style of racing of the team is going to change? That for sure is going to change. In the classics not because we have this outstanding athlete that is Greg, who will be our clear leader. Before we had all these upcoming riders and strong classic riders that had their own ambitions but now we have only Greg. But I'm actually looking forward to stage races because we will have this fire of racing like when I started this. The reason why I started was that I liked the motion, the movement on the bike, all that action. If you control something, there is no action and it is boring. How was it for you to help Greg Van Avermaet keep the Yellow jersey at the last Tour de France for so long? It was cool. Honestly, it was a dream come true. Eight days in yellow after the team time trial. Getting it after the team time trial was already special and then defending it was an honour for me because he is a really good friend. Every evening we had the Yellow jersey in our room again, because we were roommates, and we honoured it every day. This was special. Maybe a couple of years later we will see that this was a moment in our lives which was outstanding. Mostly when Greg reaches something or he has something to defend, he does it by himself. He goes in the breakaway or the mountains by himself and he surprises the whole world. Do you think that Greg got the jersey longer than what people were expecting? For people outside, maybe yes, but for people inside like his trainer Max Testa or me it was not surprising. He had won already a stage in the mountains in the Tour, he can climb, he is really impressive on the climbs. I was not surprised, I thought he could keep it even longer but it was good how it was. Do you think this year he and the team will try again? Certainly, in front of his home crowd. He knows how to do it and he is creative. We have a team time trial again and we have a chance there. Greg is a fighter, he always tries and never gives up, keeps going and that's maybe why the crowd likes him that much. Did some time have to pass for you to realise that what you did at the Tour de France was huge or you understood it right away? I think we realised right away because we were preparing so much for it. We trained so much for that team time trial, we did many preparation races for that moment like the Valencia team time trial, the Tirreno team time trial, we knew how it is to win a team time trial. We got to keep the yellow until the end at the Tour de Suisse and for me, that was the key to know that we were ready for the Tour not only physically but also mentally. We knew how it is to have the responsibility to have yellow, we knew all these things that are nerve-wrecking. When you have the yellow jersey the first time you don't know what to do and the whole peloton looks at you. But if you have experienced that before, you know exactly how it will feel. But in the Tour, it is still a bit more special, because there is so much attention. But as we were already this group of friends for many years we could take each other to the ground and realise it. You were also in the team when Cadel Evans won the Tour de France, were the experiences similar? I can actually say that then I didn't realise what had happened. With Cadel it was my first Tour and getting in Yellow into Paris was really special because we didn't know and I didn't know what it was all about. It was my first Tour and then he got yellow on the day before Paris so we actually didn't have to do so much for him, we didn't have to control the race for days like Sky because we had it only for Paris. I got into Paris with goosebumps. Maybe now, years have passed and we got the jersey a couple of times, so each time you get a bit less anxious about whether you're capable of performing and defending. But you still get excited. Do you already know what your season is going to be like? Yes, I'm gonna go to Valencia and then Oman, which is one of my favourite races and then going into the cobbled classics. I will go the same path to the Tour de France including the Tour de Suisse, which I like not only because I'm Swiss but because I get little less space with the Tour de France. If you ride the Dauphiné you get a week more but one week more makes me go down in my training. This approach works for me.